Meditation: A Path to Peace, Bliss, and Beyond. Meditation is an activity or practice where a person makes time deliberately and consciously to cultivate mindfulness. Mindfulness is intentionally paying attention to your present moment experiences with compassion, curiosity, acceptance and openness. There are many ways to meditate and people usually try a few methods until they find one that is right for them. A daily 15 to 20 minutes meditation practice is long enough to positively rewire your brain to be more flexible. Start your meditation practice today and do it for the rest of your life. The following exercise is called mindful breathing meditation. It is the most basic and simplest but tremendously powerful meditation practice. You can do it on your own without audio or other guidance, and you can do it for any length of time and in almost anywhere. Focus on your breathing and see what happens for yourself. Ensure that you won’t be disturbed for ten to fifteen minutes. Take your seat: Find a comfortable, spine straight sitting position. Sit upright on a chair with your feet flat on the floor or cross-legged on a firm cushion. Close your eyes if that feels OK with you or keep them open with downward gaze. Set your intention to focus on your breathing. Know that your mind will wander off into different thoughts, ideas, dreams, fantasies, and plans. Gently guide your mind back to your breathing. A mind naturally wanders. After ten minutes, gently open your eyes. Smile. It helps if you can set aside at least 5 to 10 minutes each morning just after awake and 5 to 10 minutes before you lie down to sleep each day for this practice, perhaps building up to 20 to 30 minutes each day. You can do this breathing meditation exercise wherever you have a few moments – sitting on a bus, standing in a line or waiting for someone. As you become familiar with it, you can use this practice during stressful situations. At first though, it is good to practice regularly at more predictable times so you can get used to it. Then it will become a tool that’s available to you when you need to create a space in moments of stress. Many people think that meditation should stop all our thoughts and rest our minds in thoughtless peace, but having thoughts during meditation is normal. Watching thoughts is how meditation works. This is the practice: not keeping your mind fixed in one place. When you notice that you are distracted by your thoughts or worries, gently bring your attention back to your breath. Use the breath as an anchor to bring you back to this present moment. Over time, you will be able to relate differently to distractions, and increase your ability to focus and concentrate. 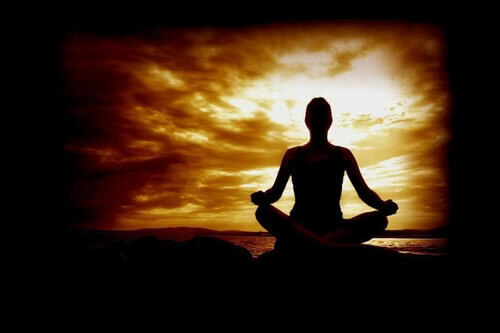 As you make a connection with breathing meditation, you are linking in with one of the oldest and most prevalent forms of meditation in the world. Breathing meditation is simple to explain and practice but even veteran meditators who practice it for decades still find something new to explore. Long term practice of breathing meditation leads to all sorts of insights about how your mind works. Make meditation your life’s habit: Herein lies the key to a successful and happy life.